What is peptide: A Simple Introduction of Peptide Synthesis. 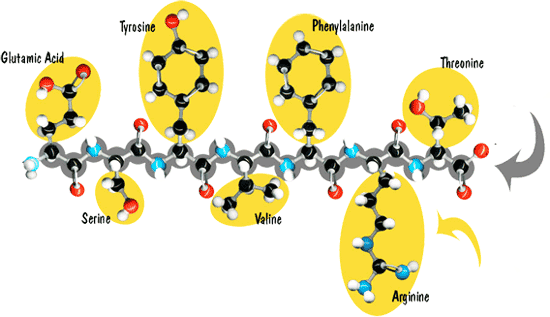 Peptides and proteins are linear polymers of amino acids linked by amide "peptide bonds" (Fig. 1). The peptide bond is formed by linking an amino group to a caroboxyl group on another amino acid. Amino acids are primary amines that contain an alpha carbon that is connected to an amino (NH2) group, a carboxyl group (COOH), and a variable side group (R). Carboxylic acid and carboxylate groups are normally not very reactive. It requires activating the carboxylic acid for the formation of the amide peptide bond (Fig. 2). The classical approaches to peptides production are called liquid-phase peptide synthesis and solid-phase peptide synthesis (SPPS). These two methods can be combined in a process called native chemical ligation. LifeTein’s standard peptide synthesis process involves the solid phase. The liquid-phase approach is used for the synthesis of short peptides, such as di- and tripeptides, and C-terminally modified peptides, such as enzyme substrates. The controlled peptide synthesis requires selective protection and deprotection of the various functional groups: the amino group, the -carboxyl group or the side chain functional groups. The side group gives each amino acid its distinctive properties and helps to dictate the folding of the protein. Unlike ribosome protein synthesis, artificial synthesis builds peptides in the C to N direction. During solid-phase peptide synthesis, each peptide is anchored to an insoluble polymer at the C-terminus. The free N-terminal amine is coupled to a single N-protected amino acid unit. This unit is then deprotected, revealing a new N-terminal amine to which another amino acid may be attached. Then the peptide is assembled by the successive addition of protected amino acids. Once synthesis is complete, the desired peptide is cleaved from the resin. Usually, this cleavage step is performed with acids of varying strength. The by-products can be removed by repetitive washings with appropriate solvents. Polystyrene is styrene cross-linked with 1–2% divinylbenzene. It is a popular carrier resin in SPPS. Other common gel-type supports include polyacrylamide and polyethylene glycol (PEG). Polystyrene is chemically inert under SPSS conditions. It is physically stable and permits the rapid filtration of liquids, such as excess reagents. The solid support allows the introduction of a large variety of anchoring groups. This causes the resin to swell in solvents suitable for SPPS. Highly cross-linked (50%) polystyrene offers increased mechanical stability, better filtration of reagents and solvents, and rapid reaction kinetics. Amino acids have reactive moieties at the N-termini, C-termini, and side chains. One category of protecting group allows temporary protection of the α-amino group. Another type of protecting group can permanently protect groups by blocking the amino acids’ side-chain functionalities. Permanent protecting groups have to withstand the repeated cleavages of the temporary protecting group. They are removed only during the cleavage from the carrier resin. Untimely removal of protecting groups can cause the formation of undesirable by-products. Once purified, individual amino acids are reacted with these protecting groups and then selectively removed during specific steps of peptide synthesis. Two protecting groups, t-Boc and Fmoc, are common in solid-phase peptide synthesis. The Fmoc method offers a mild deprotection scheme. This method involves a base, usually piperidine(20–50%) in DMF in order to remove the Fmoc group and expose the α-amino group so that it may react with an incoming activated amino acid. The advantage of Fmoc is that it is cleaved under very mildly basic conditions, but it remains stable under acidic conditions. This allows the use of mild acid-labile protecting groups, such as Boc and benzyl groups, to be used on the side-chains of amino acid residues of the target peptide. Fmoc is often preferred over Boc because of its ease of cleavage. The Boc/Bzl-strategy requires anchoring groups, which tolerate repetitive TFA treatment. Usually, the inorganic acid HF is used for the final cleavage, which limits batch size and choice of reactor. The Fmoc/tBu-strategy is the most popular of theses. It can be automated far more conveniently than the Boc/Bzl-strategy and it can be scaled as needed. The following graphs show the Fmoc (base labile, Fig. 3) and the Boc (acid labile, Fig. 4) for the amine terminus of the amino acid. Solid phase synthesis consists of assembling amino acids from the C-terminal to the N-terminal. SPPS allows efficient removal of excess reagents and soluble byproducts after each reaction cycle because the peptide remains anchored to an insoluble solid resin support. Resins commonly used are composed of polystyrene. The controlled synthesis of peptides and formation of amide bonds requires the use of reversible ion of the amino group. Three common protection chemistries are: tert-Butoxycarbonyl (tBoc), 9-Fluorenylmethyloxycarbonyl (Fmoc) and N-Allyloxycarbonyl (Alloc). These represent different protection and deprotection chemistries. It is also necessary to reversibly mask reactive side chain functional groups. After the anchoring of the first amino acid onto the resin, the Fmoc group is removed. To confirm that the Fmoc protecting groups are removed, a kaiser test is performed. Then another Fmoc amino acid is attached by activation of its carboxyl group (Coupling). See examples of the coupling agents at Fig. 5. Fig. 5: Examples of coupling agents. A kaiser test is needed to confirm the complete coupling. The process is repeated through a cycle of deprotection, coupling and washing until the peptide is completely synthesized. Then the synthesized peptide is cleaved from the resin and side chain protection groups are removed. The synthetic peptide purification is usually including the peptide precipitation from the cleavage reaction mixture by the addition of diethyl ether. The peptide and resin mixture can be suspended in water or aqueous acid and filtered to remove the resin. Further purification can be by gel-filtration, ion exchange chromatography and reversed-phase HPLC. Many types of research require peptides of 80–120 amino acids. These large molecules can be synthesized successfully using LifeTein’s PeptideSynTM strategy, which incorporates chemical ligation technology. The unprotected peptide chains react chemo-selectively in aqueous solution. The most common form of chemical ligation involves a peptide thioester that reacts with a terminal cysteine residue. Most synthetic strategies may yield crude products that cannot be purified by standard chromatographic protocols. The PeptideSynTM technology allows selective coupling of unprotected peptide fragments. Subsequent purification involves only the removal of unreacted fragments. This technology is routine at LifeTein in the synthesis of long peptides for research purposes. LifeTein has already succeeded in producing very long and complex peptides that could not be produced elsewhere. Solid-phase peptide synthesis involves only a limited number of undesirable components—by-products. However, the identification and removal of these undesirable components can be problematic. Acidolytic cleavage yields a crude product containing both the desired peptide and impurities, such as deletion peptides, truncated peptides, incompletely deprotected peptides, modified peptides, scavengers, and by-products derived from the cleaved protecting groups. All these contaminants have to be removed. The impurities are very structurally similar to the desired peptide product. This necessitates high-performance methods such as UV peak detection and reversed phase high-performance liquid chromatography (RP-HPLC), which uses C18-modified silica as the stationary phase. The purification of relatively small numbers of peptides requires a universal HPLC material. The process must be very chemically stable so that the same column can be for the acidic, basic, and neutral eluents. The pores must be large enough to allow for good mass transfer characteristics for the largest of the synthetic peptides but not so large so that the loadings are low for the smaller peptides. The particles should be spherical so that they can be packed using dynamic axial compression and should have a narrow particle size distribution to promote permeability and packed bed stability. The properties of an individual peptide depend on the composition and sequence of amino acids. The target peptide and impurities are retained by the stationary phase depending on their hydrophobicity. Very polar contaminants are eluted at the beginning of the process, with aqueous 0.1% TFA. Then the polarity of the eluent is gradually reduced by continuously increases of the proportion of acetonitrile. The elution of material is monitored at 220 nm. Fractions containing sufficiently pure target peptide, as determined by analytical HPLC, are pooled and lyophilized. The purity of the lyophilized target peptide is determined by analytical RP-HPLC followed by UV detection at 220 nm. Amide bonds and other chromophores absorb light at 220nm, but water and residual salts are not detectable under UV-spectrophotometry. Normally, the peptide is delivered as in TFA salt form, which is the natural results of the RP-HPLC purification. The side-chain functionalities of Arg, Lys, and His and the free N-terminus form trifluoroacetates, and small amounts of TFA may adhere to the peptide. These contaminants cannot be detected by analytical HPLC. The resolution of analytical HPLC expressed as relative area because it corresponds to the area of the main peak over the total area of all peaks. The resolution of analytical HPLC can be improved by selecting an optimal buffer system, stationary phase, gradient, and column temperature. The expertise of the analyst is of the utmost importance in the analysis of this type of data. Net peptide content is defined as the number of peptides relative to nonpeptide material, which usually consists mostly of counterions and moisture. Hydrophilic peptides can absorb considerable amounts of moisture and, depending on the conditions of final purification and lyophilization, the NPC can vary from batch to batch. Low net peptide content could be expected for peptides containing large numbers of basic amino acids. NPC can be determined by amino acid analysis. Peptide impurities may include deletion sequences (peptides lacking at least one of the required amino acids), incompletely deprotected sequences, truncated peptides, and by-products formed during peptide synthesis or cleavage. The purity of a peptide can vary from batch to batch. When a peptide is ordered at 90% purity, the quality of the product can range between 90% and 99%. Lower-purity orders may have a wider range. Low-purity batches contain a considerable number of peptide by-products. These peptide by-products may show biological activity, but it will not necessarily match the activity of the target peptide. In some cases the impurities may interfere with the assay. The net peptide content in the low-purity peptides varies. It can be affected by the polarity of the amino acids, the lyophilization process, storage conditions, and other conditions.